Blending a scoop of protein powder with 8 ozs. of orange juice provides a nutritious meal replacement or an optimal post-exercise recovery snack. Most protein powder manufacturers suggest mixing one scoop of protein powder with 6 to 8 ozs. of water, milk or fruit juice for a palatable beverage. A container of protein powder almost always includes a premeasured scoop to take the guesswork out of serving sizes. 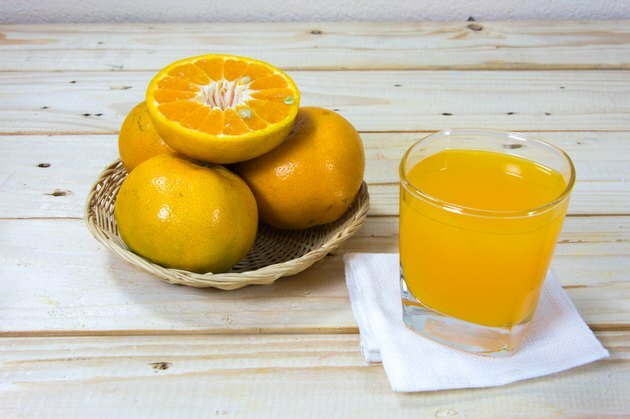 A cup of unsweetened fresh orange juice provides 112 calories, including 26 grams of carbohydrates, 21 grams of sugars, 2 grams of protein and less than 1 gram of fat, according to the National Nutrient Database for Standard Reference. This amount of orange juice offers more than 100 percent of the recommended dietary allowance, RDA, of vitamin C, along with 19 percent of the RDA of folate and 11 percent of the RDA of potassium. A 33-gram scoop of whey protein powder has 120 calories, 23 grams of protein, 5 grams of carbohydrates and 1.5 grams of fat, according to LIVESTRONG.COM's MyPlate. The same amount of soy protein isolate provides 112 calories, 27 grams of protein, 2 grams of carbohydrates and 1 gram of fat. A comparable scoop of egg white powder offers 124 calories, 27 grams of protein, 1.5 grams of carbohydrates and zero grams of fat. For a tastier and more filling beverage, blend 1 cup of orange juice with a scoop of unflavored protein powder, a medium-sized banana and 2 tablespoons of peanut butter in a blender until smooth. You will enjoy the added benefits of increased dietary fiber from the banana along with heart-healthy unsaturated fats from the peanut butter. These ingredients contribute about 300 more calories to your beverage, making it more of a meal replacement than a snack. The citric acid in orange juice and other citrus juices denatures the protein in protein powder prior to ingestion more than other liquids like milk and water. While this may negatively impact the taste of your drink, it won't significantly change its nutritional efficacy. Once you drink the beverage, the much stronger hydrochloric acid and pepsin in your stomach will denature the proteins into amino acids for use in your body.